The Link Accessory Table is part the Tumbling Block Line. The Tumbling Block Line was inspired by Charles’ mother’s tumbling block quilt work. Charles usually avoided the imagery of putting one stone on top of another in a pyramid like shape because he felt that it had been overdone and overseen. This imagery has been used and visualized by ancient civilizations including the Babylonians. It’s a 6 million year old shape, and is most commonly used shape in classic modern architecture. With all that being said, the motif did keep showing up in his mother’s work and eventually he decided to address it. The Tumbling Block Line is a result of that. 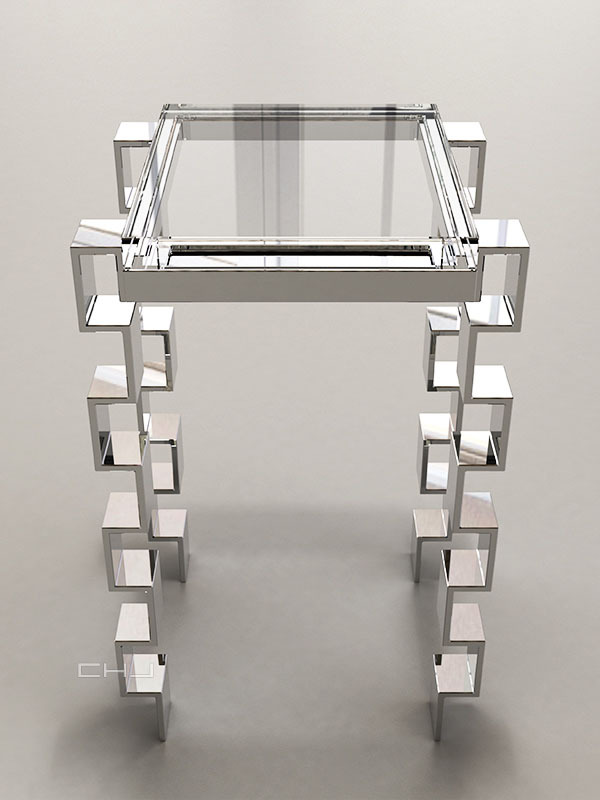 Charles brings some variation to the tumbling block form however with his use of thick metals and thick acrylic. In Charles’ work it’s used more as a cantilever and as a structure in design rather than to show people that he understands the engineering perspective.